Autodesk Revit: How to rotate a plan at any angle? 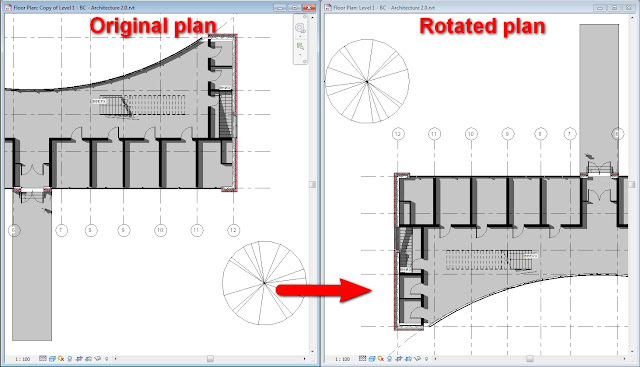 Not so long ago, one of the readers of my russian blog posted a question — how to rotate a plan at 180°? 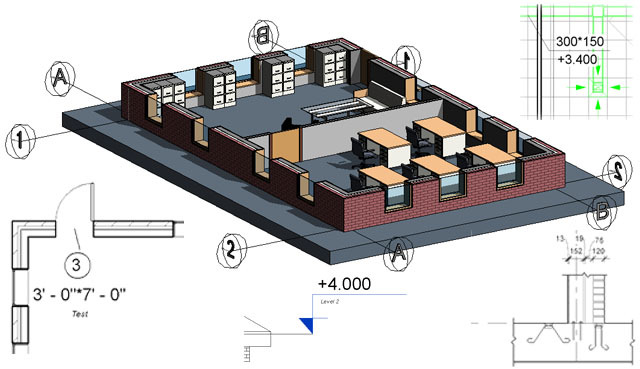 It can be necessary while working with the objects that are plotted in the plan as inclined to each other at characteristics angels — for instance, in cases of complicated buildings. The user needed to construct complicated front stairs, that would be more convenient to be created north-oriented. 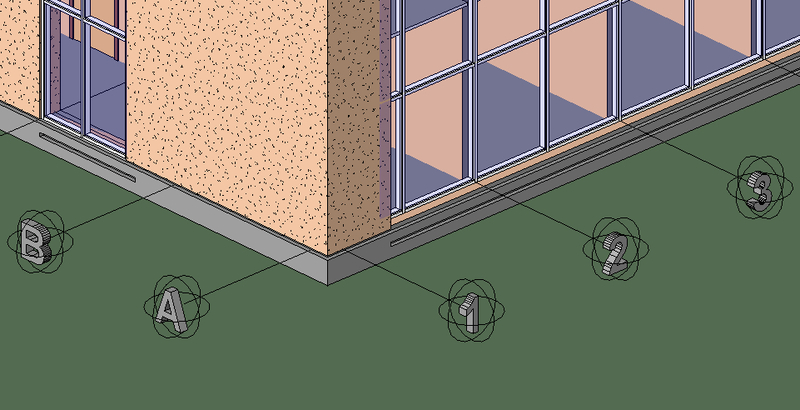 There are at least two methods to solve the issue — using crop view or shared coordinates. It is convenient to use crop region rotation, if it is needed to turn only one plan and shared coordinates - when you need to direct several plans in the same way. 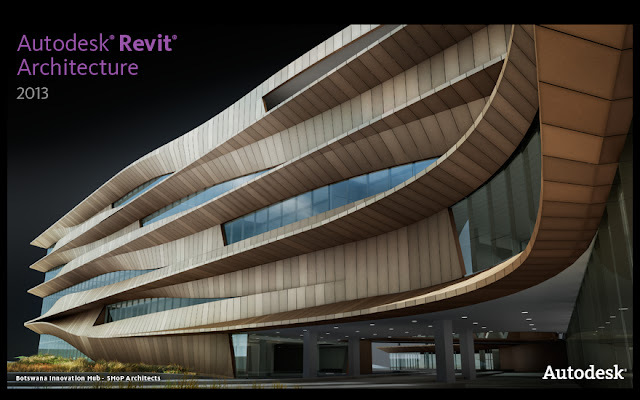 I created first free and full on-line video Russian tutorial of Autodesk Revit Architecture in 2011 spring , then of Autodesk Revit MEP, Autodesk Revit Family editor, Autodesk Navisworks. Up to present days my training courses are ones in Russian web. A lot of time I was planning the same training on English, but cause of my poor English skills I wanted to improve language first.But it takes a lot of time, so now I decided to record first version of tutorial. I hope to update this material as soon as I improve my English. 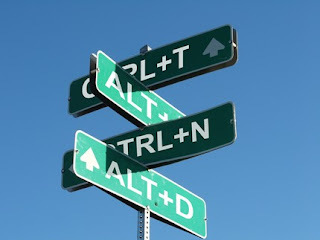 "Shortcuts" (or "hotkeys", "fastkeys", "shortkeys") are key combinations, which allow you to use functions in applications faster by pressing buttons on your keyboard. These combinations increase your speed and productivity by minimizing amount of mouse moving and clicking. 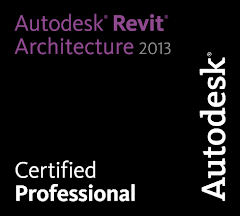 Short keys are based on the names of the commands in Autodesk Revit. For example, function "Door" corresponds a short key "DR", for a "Grid" - "GR", and so on. Buttons should be pressed one-by-one, at first - letter "G", and then "R". You don't need to push "Enter", Space or nothing else. After pressing second button function activates immediatly. In my every Revit courses (I'm certified Autodesk Revit instructor) I pay much attention to on using these keys, because they can improve your workflow and make it faster and convinient. To help Revit starters in using them, I've make this short list of my own Revit most useful short keys. Of corse, this is only a small part of keys you are able to use, but I believe it can be useful during your first Revit steps. Revit Architecture 2013 - what's new? Every season many of us are looking forward to the incoming of spring! The reason for this is not only anticipation of the sun, heat, and flowers, but the release of Autodesk products new versions. 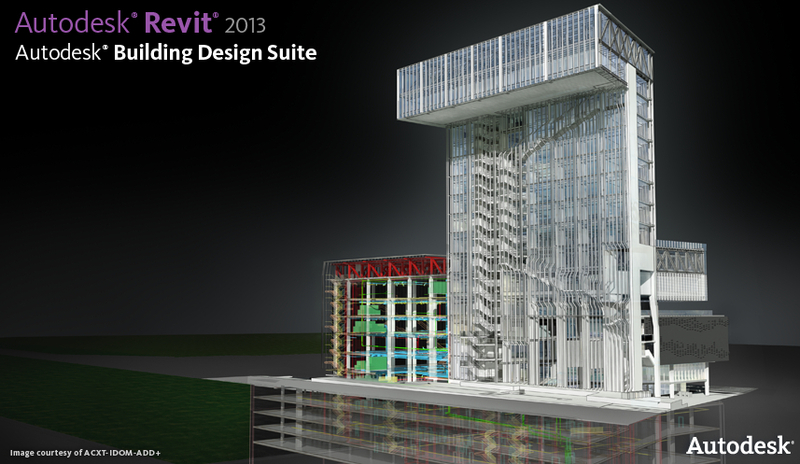 I present a review of the main Revit line innovations in series of reports. We are going to talk about not only what is new was added to a specific product, but also on global changes in the platform (I have to highlight that they really worthy of attention). As I try to publish the material immediately after the official product release, then I do not pretend my survey to be complete and absolutely accurate. The article will be expanded; there will be more specific material and examples of use. Follow the updates.